Windows default search is slow as it uses the indexes to find files and folders, but incase the files your looking for are not the index there’s possibility of not finding the file even though it exits.Advanced options for Windows Search settings are also limited. There are alternate software for searching files on Windows like Search Everything, and also Desktop search tools for search engines. SearchMyFiles is a portable search tool for finding files and folders in Windows as an alternative to “Win dows Search”.This tools also doubles up as a duplicate file finder, for identifying duplicate files on your machine. 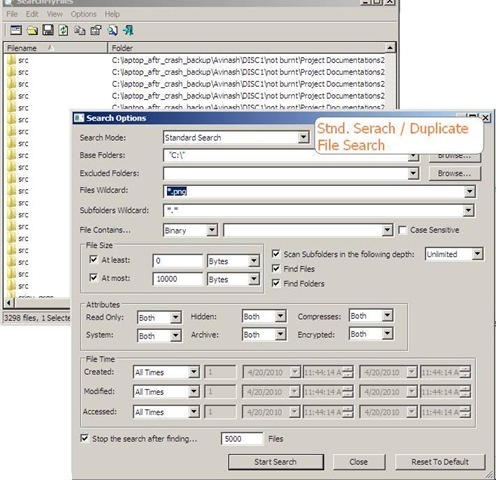 Incase you have lots of files on your machine, you can also restrict the search to a limited number of search results.It also supports wildcard searches and search results can be saved as list into text/html/csv/xml file, or copied to clipboard. or Right click on files in search results for more options. Being a portable app this makes it even more easier to carry this app in USB drives and is compatible with all Windows OS. Interesting if you need a portable search tool…normally I work with Lookeen (http://www.lookeen.net) to search my files and desktop and I am very very satisfied with that tool!